For that simple reason, I cannot be without a book in my life. Even if they rustle up emotions in me that have me mourning a character as deeply as if they had been a living, breathing person. Luckily, they can also instill feelings inside me that I can take on the world. I just need to find the right book. Usually, I just read any book which comes my way. Sometimes they are recommendations, and other times they are books I have been longing to read for ages. Other times they are found in the bargain baskets of local bookshops. While the latter is a good option economically, it can also result in wasting my time turning the pages of truly awful books. So, when the time came a few weeks ago to restock my library, I took the time to really think about what I wanted to read. I had been making a list of books which had caught my attention, and choose selectively from this long list of titles. Others where beauties I just happened to stumble by. 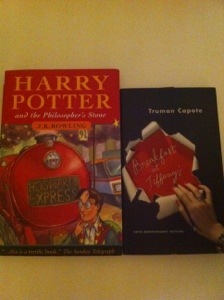 The bookworm inside me cannot wait to get stuck into these, but first, for my fellow reading enthusiasts, a haul! The books I bought can be separated into 4 categories, with the first being fiction. It includes ‘Sharp Objects’ by Gillian Flynn simply because of how great ‘Gone Girl’ was. I have ‘Nights of Rain and Stars’ by Maeve Binchy and ‘Message in a Bottle’ by Nicholas Sparks as these are authors whose work I always like to read. 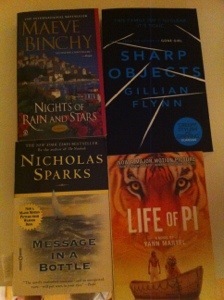 Finally, I selected the ‘Life of Pi’ by Yann Martel. People have raved about the film so much I thought why not try the book (we all know that reading the book first is better). It was also just €1 at a market so it is not a major loss if I hate it. We have the ‘reread’ book next, and one I should be ashamed of if the reactions of some people are anything to go by. I am not going to apologize though. 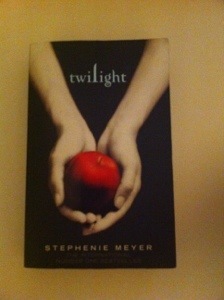 I loved ‘Twilight’ by Stephenie Meyer and I can’t wait to read it again. Next up are the classics, and I use that term as loosely as possible. This is not Jane Austen or Charles Dickens we have on our hands but ‘Harry Potter and the Philosopher’s Stone’ by J.K. Rowling and ‘Breakfast at Tiffany’s’ by Truman Capote. Both are older releases which I am finally getting around to reading. Lastly, we have the non-fiction section. 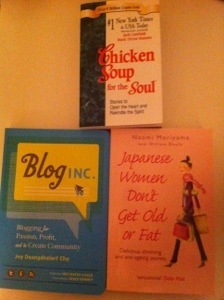 All 3 are again books I have been wanting to read for ages. ‘Blog Inc.’ by Joy Deangdeelert Cho will do exactly what it says on the tin – help me to improve my blog. My interest in food (and perhaps the vain part of me who wants to stay looking young) brought me to ‘Japanese Women Don’t Get Old or Fat’ by Naomi Moriyama. Finally, ‘Chicken Soup for the Soul’ by Jack Canfield and Mark Victor Hansen because sometimes I need cheering up and a kick up the backside to keep me motivated in terms of my own life goals. I would love to hear your opinions if you have read any of these books. Please also feel free to send me some recommendations! PS: As a quick tip, for any expats looking for English books in Berlin, get yourself on Sundays to the market in Boxhagener Platz where there is a large selection at €1 a piece!